Antiques experts travel the breadth and width of the country in search of rare curiosities and antiquities. Anita Manning and James Braxton head out to Stamford and Boston. a goal, to scour Britain for antiques. It is a bit like fishing. there is a lot to see here. He seems to be heading back for the door. Lucinda? I prefer the personal shopping touch. Don't we all, James. favourite. This is a fun bell. First impressions is an amazing choice. the raw state. They are, the pods of the Amazonian Brazil nut tree. at 25, something like that they will be a candidate. He is rousing on. bargain. Let's hope so. He is interested in a 1970s letter opener. your coat, James. I has also had a busy morning in another local shop. within the hollow part of the pen, which also has a Fountain neighbour. market loves this type of Scandinavian stuff. And I love it. impressive three lots at a total cost of ?120. Woodwork, Anita. exercises your brain every time you come to change gear. well. Now in third gear. That engine is sinking. Nice little canvas top. Cross prisoner of war camp which operated during the Napoleonic wars. of powers, including Britain raged through the 18th and 19th centuries. things? They were encouraged to make these things, it was a tradition. the prisoners at the Battle of Trafalgar ended up at Norman Cross. keeping the prisoners happy they have less reason to try and escape. escape in there, was tried by French prisoners at Norman Cross first. transforming society and brought a new passion for ingenious machines. that, James needs to be off. He still has a bone to pick with Anita. honest, you really have no idea what you are doing. Blow through there. James? Anyway, they are driving towards Spalding in Lincolnshire. Spalding was particularly famous for its wide fields of colourful tulips. died. That is the part that is left. And it has created three more bulbs. was an invention by a Mr Tennant, who came from a village up the road. the fire, doing the washing up the same time. Simple but effective. with these ones? These are daffodil bulbs, and they have been lifted. Now, they are going to be put through a machine which cleans them. is time for Anita to get onto her it has been a most interesting visit. the worst weather the Road Trip has ever seen. immediately heads upstairs to the area run by his namesake James. James! I am James. That makes it very easy. Dealer James 's an Xbox. is Czechoslovakian, and I would say that it is fairly new, am I right? You are probably right, I do not think it has got any age to it. Anita's last buy is in hand. So, James had better get a move on. unusual antique shops I have been into. This is a huge treasure trove. James will have to check them as he goes around and Jack is no pushover. away with anything too cheap. I hope not. That seems quite priceless. to be 1930s. What could Jack let it go for? ?10. I was hoping for ?5. that was a good buy. She is impressed, now for Anita's lots. for that? I paid ?20. That seems cheap to me. Just a bit of daftness. pencil and pen. Is it silver? I would say 22? ?20. I nearly had it. started with ?200. James spend ?153 and has five lots to show for it. yet we have 25, is it 28? 208I have got, is their 30? It has got to go. with the name of this town. 20 I have got in the room, is their 22? Abhay got 28? 28 at the back, standing. 30, is their 32? ?30. an impressive profit of ?97 giving him ?297 to be going along with. got a one track mind. Is he married? James is trying to multitask. do when I am concentrating. 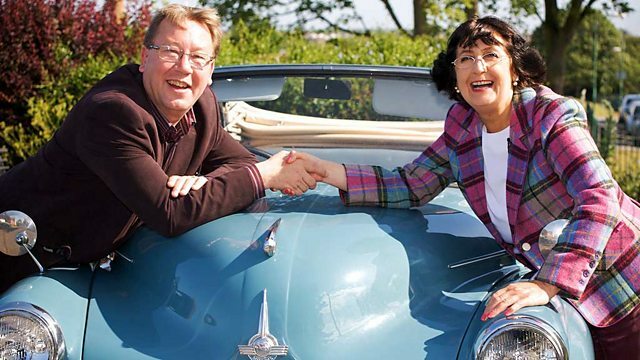 It is the start of a new week for antiques experts Anita Manning and James Braxton. Braving the inclement weather, they head out on the road through Stamford, Lincolnshire and Boston.